According to this historical report attached bellow, the transfer of Somali districts did not happen in a vacuum. Responsible parties of robbing Somalis were gangs comprising of Abbay Tsahaye, Federal Minister of Federal Affairs, Abadulla Gemeda, Federal Minister of Defense, Dr. Mullatu Tashome, Speaker of the House of the Federation, Mahmoud Dirir, Federal Minister of Mines, and the two presidents of the two states, Junadin Sado and Abdi Jibril.” If justice is about to be served, these remnants of the previous regime must answer legal questions posited by the Geri Garad and the Guurti in 2005. The unabated aggression of ethnonationalist Oromo regime against Somalis, killing many innocent civilians as this report goes into publication is nothing more than a continuation of what had been instituted by the twin evils of TPLF and OPDO that had marginalized Somalis. The Somali regional government must work hard to protect the land and interest of the Somalis. WardheerNews would like to share this report once again for historical posterity. Government is, by nature, a useful mechanism for the survival and protection of the public at large from internal disorders and external aggressions. In domestic cases, as a result of competition for life, in the course of interaction, conflict, competition, and offensive acts are some of the inherent characteristics of human being, in which, one may be aggressive and hurt others and the strong may force the weak. Therefore misunderstanding and disputes between parties are, likely to be unavoidable. So, this reality definitely necessitates the existence of a legitimate power to regulate human behavior in time and space. However, any institution entrusted with this huge responsibility should, primarily, be capable and effective in its crucial duties and above all, be impartial in all engagements and judgments, so as to breed the fruits of justice, equality and build the public trust and confidence in the concerned system. In the normal course of things, better education, economic growth, employment opportunities and above all self-administration amount development, but with all these in hand, the contrary is observed in Somali Region. These seemingly positive changes have, exceptionally, proved to be more pernicious than beneficial to the public. To worsen the situation, despite the federal government that corresponds to that of the unitary one, there are regional states, set to closely serve their own people in all aspects of public interest, and did difference in all states other than Somali Regional state. In contrast to the above, the current Somali Regional Government, certainly, works in reverse direction and against the constitution in all aspects. The Somalis, who luckily survived from the brutality of the socialist military regime of Derg, are now continuously suffering far more badly under, interestingly, the long-awaited system of Democracy, in which all kinds of rights are strictly protected in the constitution. People started to associate democracy with Venality, and improper use of power as a soothe device. So, Democracy- known before, as the ultimate solution to all social and political problems-is now increasingly replaced by a demo crazy in the minds of many Somalis, in the sense that, in many occasions, it practically bred widespread malfeasance and unaccountability., Instead of better care and development initiatives for the public, they became subjects of slaves of their own interest. With no reasonably enough justification, there are full-scale chaos currently taking place in the area in front of countless eyes. Firing and appointments are some of activities done on the sole interest of one group or single person. Bureaus with political or economical importance are often special to individuals strongly trusted on conditional deals, irrespective of their capacity. They are selected for their degree of yes, dauntlessness and loyalty to their interest motivated godfathers. As a result, simpleton, sub servants and gullible persons lead most of the leading bureaus, with the exception of limited ones. Law enforcement and judicial institutions are also not free from all sins, but play active role in many irregularities. Arbitrary arrest and intimidations on often-verbal orders by officials and negligence are widespread, including inability and sometimes-intentional partiality in their duties is some of many more immoral acts. Friendship, kinship and bribe are the most prominent factors for prevalent biased application of law. In the region, money interestingly prevails over the law and misdirects the justice. This, indeed, proves the full application of the common saying “Ganzab yaallaw Saw Saamaay Mengedh “, which, literally means- He who has many can travel in the air. The observable proof for all these misdeeds can be the last crime in which the interim president has unilaterally sacked a dozen of bureau heads and civil servants without the knowledge of both the party leaders as well as the cabinet. He also personally, illegally and unashamedly rejected to see the case of certain heads unanimously criticized by party leaders, by the virtue of being his basket breads. In doing so, informality is not only more preferable than formal and legal procedures in all government matters but also more acceptable in many levels of the regional structure. Corruption and grafts are not a new phenomenon, rather a part of the government daily activities. More than fifty million ETB (or $10 million dollars) was officially declared looted so far in the region. Many implemented projects are still functionless due to mistakes committed in both planning phases and implementation processes, and as a result ended in creating conflicts between brother clans. Despite the economic motives for planning, allocations of development projects are always used as political spices. Any friendships or enmity between Leaders of any level are made on interest. The new normalcy of for me and I will do for you is not a shame but a show that apparently exposes the extent to which corruption and related irregularities are witnessed. In Cabinet meetings, there is a rare day left without being approved huge amount of money for security purposes. Clashes are often resolved in a manner that it can go off the next day, as a justification for the second approval. At last, there is no referable documented record of regions security file in any office. For instance, during the last several years alone, thousands of people were killed in conflicts, created in different ways by various reasons, across the region. To cite some, Abaskul and Dalal Guled, Reer Sheikh Aba-Yonis and Abrahim, Reer Sheikh Aba-Yonis and Ismail Gumadle, Bi’iidyahan and Muse Gumadle, Gaadsan and Reer Abdille, Abaskul and Reer Hirsi, Sheekhaash and Ali Wanaag and others were among the major ones. No one zone of the region remained unaffected by these clashes. Under a pretext of maintaining security, unknown number of people is held for entirely unclear reasons behind the bars without due process followed. But, now, after enough became enough in the region, the game was diverted to confuse the Federal Government, by creating intra-national conflicts. For the sole purpose of creating a buffer zone for free exercise of power misuse, persons believed to have political potentiality are either subtly attacked or forced to join them. Rational thinking is the very enemy of the present regional leaders, as this may open pace for accountability and transparency in the system. Rule of law, basically requires legal frameworks that are impartially enforced by incorruptible forces, but, to the contrary, as has been practically observed in many occasions, requirements of the rule of law in countless cases were out of question due to lack of accountability from all concerned sides. To be frank and open, the region is like a jungle in which injustice is the king. Because, there is no protection for all except those who take the law in their hands and using logic makes one victim of his own reasonable words. If there is a time silence is golden, this is surely the time for the people in the region. The same is also true if there is any time to act or react, if a hope of taking correction measures is not in sight. Among other things, one may safely claim that the main reasons and the root causes of such problems are part and parcel of the past legacy in general, and the present leadership in particular. Therefore, it is neither hasty generalization nor exaggerated observation to point out that, under this brutal reality, there is neither system nor leadership in the region. Several times have officially, been pronounced the non-existent situation of the regional government in different evaluation meetings by Federal and the Regional States. But, for wonder, how could responsible institutions with the needed capacity and the full mandate to act against such evil, happen to remain indifferent, unless concerned individuals have an obscure interest of their own. As part of their confusing strategy, the regional leaders, perhaps, with others, have started playing another extremely risk game as a cover for their destructive role in the Region. The dispute between Somali and Oromo states over the long border they share is another plausible test against the leadership of the Somali Region and the related Federal institutions, in light of the verbally and recently claimed good governance. From the very beginning, many new areas, which were not, previously in the disputed, were, purposefully included into the 12 Woredas or districts that have been on question for the last decade. 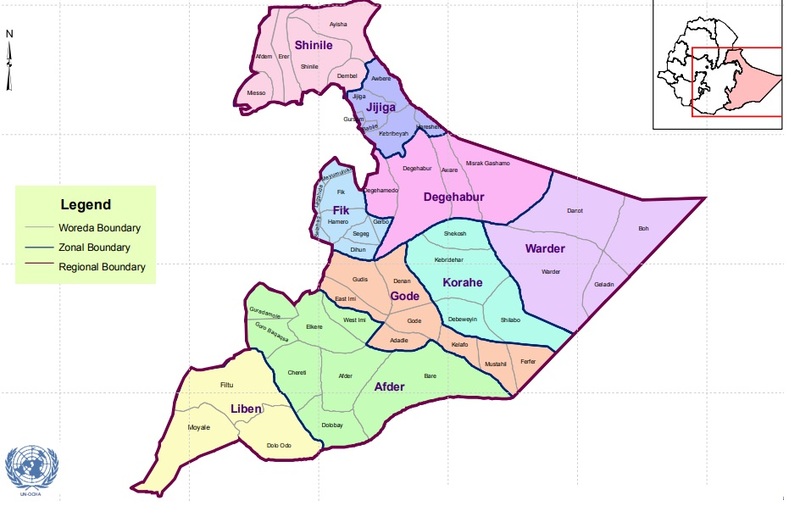 For instance, Jinacsani and its environs- a part of Jigjiga district -lived together by two brother tribes, has never been on question after a failed trial by OLF in early 1993GC, which resulted in a tribal conflict that claimed the lives of more than a thousand as well as significant material damages. However, expectedly but exceptionally, due to indifference and irresponsible character of Somali region representatives, accompanied by secret deal between the two state leaders as well as the unpalatable effort of the strong, influential and determined representatives of Oromo side, probably backed by other invisible elements, have, certainly resulted in a sudden inclusion of the unlucky little Somali town of Jinacsani into the disputed border areas as part of their strategy to change its fate for ever. The issue of Jinacsani case was raised in a meeting held in Addis Ababa, organized and chaired by Minister of Federal Affairs and attended by other Oromo and Somali senior officials in federal institutions, including both regional presidents, for the first time in ten years. After a long heated debate, an assessment team was decided to be sent to the area and report their finding to the committee in two weeks’ time. The team held meeting with more than 700 elders drown by themselves from all corners of Jinacsani kabalee and asked about if any of them claim Oromo. But, wonderfully the team found negative and then reported to the committee that Oromo can no way claim Jinacsani anymore. As a result of their report, the Oromo members of the team were automatically expelled from the OPDO party on the spot and accused of transferring Oromo land to the Somalis. This play did not happen in secret but in front of Abbay Tsahaye- Federal Minister for Federal Affairs, Abadulla Gemeda-Federal Minister for Defense, Dr. Mullatu Tashome- Speaker of the House of the Federation, Mohamoud Dirir-Federal Minister for Mines and the two presidents of the two states Junadin sado and Abdi jibril. Worst of all was that, for probably unknown reasons, referendum coincided with time of high split among Somali leaders. So this might have proved the effectiveness of the saying- that the friend in need is the friend indeed-. After probably two months, again another meeting was held for the sole purpose of the little Kabalee. But this time the Somali representatives easily accepted the outcome with little resistance and gave up their argument. LET THE LAW PREVAIL OVER THE BARBAROUS ACTS.